When Logan was nine years old, her father landed a promotion and moved the family back to his old stomping grounds in Columbia, Mo. Logan traded in her old friends and a familiar setting for a new school filled with new faces, but she did get at least one good thing out of the trade—Andrew Amsel. But life has different plans for Logan. And now at twenty-two, she is in the midst of starting over when Jorgen Ryker moves in next door. Jorgen, a paramedic who grew up along the Missouri River bottoms, seems normal, and he's definitely easy on the eyes, but Logan still has her reservations—and her secrets. Can she put her old life aside to start anew? And what big secret is she hiding that Jorgen might already know? 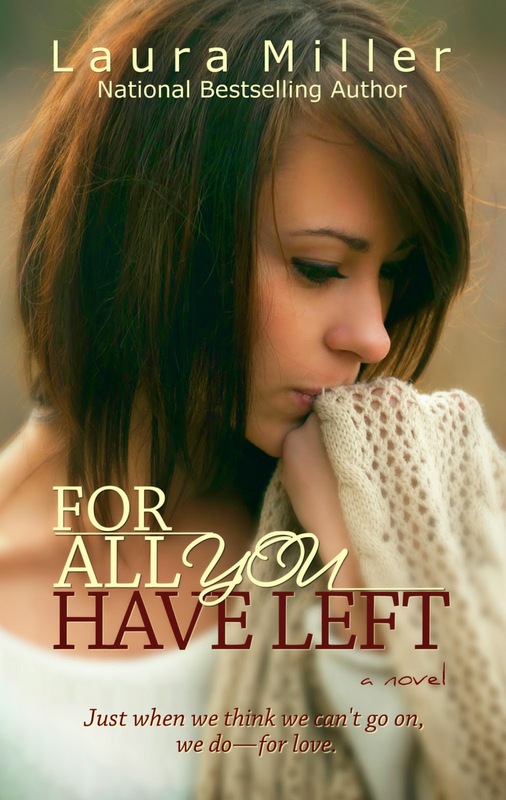 For All You Have Left is a love story with an unexpected twist centering on three lives, two great loves and one epic journey in learning to love again. Let me start off by telling you how I began to read this book. I had just received it in a beautiful package so I ran to the pool and sat out with my cousin and friend. While they are being typical girls tanning I am screaming like NOOOO DON'T LET IT BE!, OH NO!, OH GOD I'M GOING TO CRY! These reactions make people look at you crazy but in our little bookish world it usually means it could possibly be an exceptionally amazing book. Laura Miller brought out every emotion in me through her writing. Andrew made me fall head over heels in love with him within the first few pages. He is seriously a dream boat. Logan is so completely in love that even though her world gets turned upside-down you can't help but feel her every pain and completely understand the undying love. I seriously tried to predict what was going to happen and what happened in the past but of course it didn't turn out how I thought. I swear half of the events were put there just to torture me. Then of course there is Jorgen. Man how do you not love him but at the same time still completely love Andrew. It killed me but he was a whole other level of amazingness. First of all, completely gorgeous, then he is super funny and sweet. He is an EMT and loves it which makes you want to kiss him even more. I seriously felt Logan's dilemma. I highly recommend this book to all the saps out there. I totally expected it to be a typical story young love, loss and heartbreak but no trust me it will throw you through a loop and keep you guessing. Laura Miller you make me a fan!